Is it mandatory to renew the registration with the State Medical Council? If yes, under what provisions of the Medical Council of India Act/Regulations etc., has it been made so and please provide a copy of the same. Is it mandatory to obtain CME Credit hours for renewal of registration? Are there any guidelines/orders issued by the Medial Council of India regarding the activities that qualify for obtaining CME Credits? If yes, please provide a copy of the same. Are there any guidelines/orders issued by the Medial Council of India regarding the accreditation/verification of CME programmes/Conferences and such other activities that provide CME Credits? If yes, please provide a copy of the same. Are there any guidelines/orders issued by the Medial Council of India regarding the fee/TA/DA, accommodation etc., that have to be provided to the officials who verify/inspect/accredit such CME Credit providing events? If yes, please provide a copy of the same. The answers from Karnataka Medical Council, dated Mar 10, 2014, are given below. The above mentioned letter itself specifies that conference/ CME programme /Workshop qualify for obtaining CME credit hours. Thus, according to KMC, neither renewal, nor its linkage to CME credits nor the process of CME accreditation, its inspection and the special privileges of the so called CME inspectors, have any sanction under any section of the MCI Act. MCI also, in its reply, stated that the Indian Medical Council Act is silent on renewal, its linkage to CME credits, CME accreditation, its inspection and the special privileges of the so called CME inspectors. The reply is here. The reply from KMC did not provide us any convincing reasons for renewal tagged to CME Credits. To probe further, we, on our own, obtained the copy of the letter referred in the reply by KMC, namely MCI – Academics/2013/30661 dated 29/08/2013, from the KMC web site itself. “The members of the academic council noted that there is no uniformity in the credit hours awarded by the different state medical councils…. It is very obvious that this letter is about awarding CME Credits to a medical college teacher attending Conference/CME/Workshop. This letter says nothing about medical professionals in general nor does it have any mention of renewals, mandatory CME credit for renewals etc. 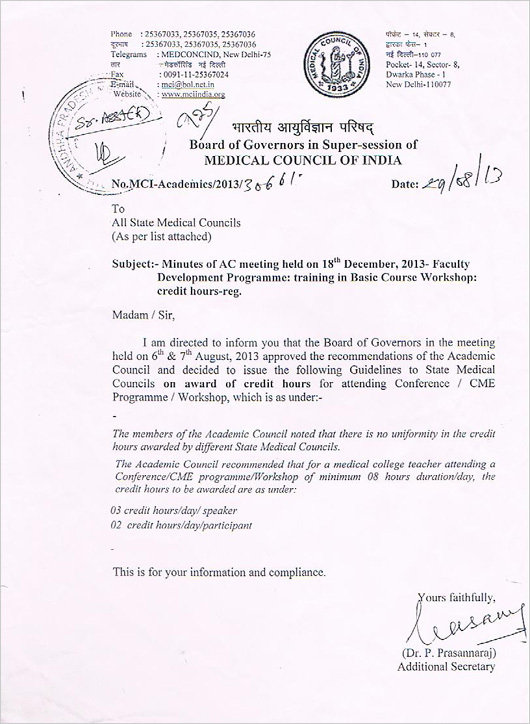 This letter also does not provide any details of creditable CME activities other than Conference/CME/Workshop for medical college teachers. It is therefore very strange that the KMC is citing this letter as the basis for making CME Credits mandatory for renewals. All these make it very clear that Karnataka Medical Council has no legal basis for renewal, for CME Credits or for inspecting and accredeting CME programmes.